Kalamazoo Sport Model KG 3/4 Model Flat Top Acoustic Guitar (1940), made in Kalamazoo, Michigan, serial # 911F, sunburst top, dark back and sides finish, mahogany back, sides and neck; spruce top, rosewood fingerboard, original brown chipboard case. The "Sport Model' is a delightful little 3/4 guitar, a relatively late addition to Gibson's budget Kalamazoo line available from 1937-41. Built on the body pattern of 1920s TG-1 tenor guitar, the just over 12" wide "Sport" is a dainty tight-waisted design compared to the more familiar and rather stumpy body of the far more common Kalamazoo KG-11. The neck on this example is fairly slim with a typical 1930s "V" profile. The pointed-top peghead is fitted with the earliest Kluson strip tuners and is adorned with the standard Kalamazoo silkscreen logo, with "Sport Model" stenciled diagonally beneath. 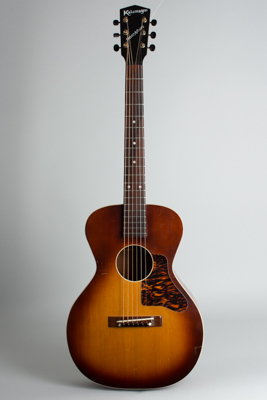 The top "sports" a typically lighter late-'30s style wide sunburst, with single binding on the edge and sound hole rim and a small firestripe celluloid pickguard below. The sound is bright and tight; this is a cool little blues picker and would make a great high-strung "Nashville" tuned guitar. While originally intended primarily for young students, this is still very nicely made. It is fully the equal of other Kalamazoo instruments, and represents an unusual value in a pre-WWII "travel guitar" with full Gibson appointments. A fairly rare small-body Gibson and dare we say an awfully cute little guitar. Overall length is 36 3/8 in. (92.4 cm. ), 12 5/8 in. (32.1 cm.) wide at lower bout, and 3 7/8 in. (9.8 cm.) in depth at side, taken at the end block. Scale length is 23 in. (584 mm.). Width of nut is 1 9/16 in. (40 mm.). This is an excellent playing "Sport", having just emerged from a neck set, fret dress, and heat press. The finish shows some light wear but is really very clean for a pre-war guitar and all original. One of the nicer examples of this diminutive shop favorite we have had, still with its original chipboard case. Excellent Condition.